Your 2011-2012 State Officer Team is excited to be working with all of you, the members, this year! We want all of you succeed in all of your FBLA endeavors. The State Officers are dedicated to having Maryland FBLA shine above all the others nationally, and that starts here, on the state and local levels. Help us get there by taking advantage of all the opportunities that Maryland and National FBLA have to offer, including the Business Achievement Awards, Gold Seal Award of Merit, Outstanding Chapter Award, and much more. As always, your State Officers are just a phone call or email away and ready to offer any assistance they can. Maryland FBLA, it’s time to enter the Gateway to Greatness! with your 2011-2012 state officer team. Shirley Zhu, a senior at North County High School in Anne Arundel County, MD, is honored to be able to serve you as your 2011-2012 Maryland FBLA State President! Shirley has been involved with FBLA since her freshman year. She has won multiple State and National awards, and was the Region 8 Vice President in 2010-2011. She has also served as her Local Chapter President and on state and national committees. Shirley is excited to be implementing new goals with the State Officer Team and is looking forward to a great year entering the Gateway to Greatness with Maryland FBLA. Tim Fisher is excited and honored to serve as your 2011-2012 Maryland FBLA Executive Vice President! A senior at River Hill High School, he has had three amazing years of experience in the organization. In those three years, he held various positions on the local, state, and national levels. 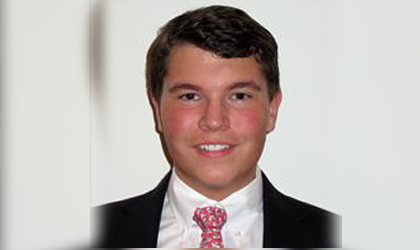 As a returning state officer, he plans to use his experience to help Maryland FBLA grow even further. He has many goals and ideas in order to build the organization and get members involved, and will strive to achieve these goals throughout his term`. As his journey in FBLA comes to a close, he hopes to make a lasting impact with his final year, and help Maryland FBLA enter the Gateway to Greatness! Katie Cano is a senior at Northern High School in Calvert County, MD. Along with the State FBLA Secretary/Treasurer she is the Northern High School FBLA President, the Northern High School National Honors Society President, and active member of the Modern Music Makers Honors Society, Key Club, Pink Ribbon Club, and the Paws for a Cause Club. This is Katie's second year on the State Officer Team and she is excited to have the honor of another year to develop and grow within Maryland FBLA. Last year, Katie had the opportunity of leading Northern High School's FBLA Community Service Project: "Ribbons of Hope." Katie and her chapter helped to raise over 25,000 for the Corey Gilger Foundation as well as collecting over 500 toys for children for Christmas, collecting books for children at Johns Hopkins, and making a difference in the cancer community via "Ribbons of Hope." In her final year, Katie hopes to have her fourth 1st place win at Regional Competitions, qualify for her fourth year attending National Competitions, and become a better leader. Julia Menton is currently a junior at Marriotts Ridge High School, and she has spent the past three years heavily involved in her FBLA chapter. In her freshman year, Julia attended the National Fall Leadership Conference in Baltimore, and this is where her journey began. The next year, Julia took on multiple positions on her chapter’s officer team and was elected as Chapter President for the 2011-2012 school year. Throughout Julia’s years in FBLA, she has attended numerous Regional, State, and National Leadership conferences. FBLA has helped Julia grow as a leader, and she is honored to serve as the Maryland State Reporter-Historian. Outside of FBLA, Julia participates in her school’s French Club and Model UN. Julia is excited to work with this year’s State Officer team in order to open a Gateway to Greatness for Maryland FBLA! Jack Fitzpatrick is a senior at River Hill High School located in scenic Clarksville, Maryland. He is honored to serve as your 2011-2012 Maryland FBLA State Webmaster. He has been involved in FBLA for all four years of high school. In this time period, he has served as his Chapter Vice-President, the Maryland State Secretary-Treasurer, and the Eastern Region Treasurer on the National Treasurer’s Council. He currently serves as the River Hill FBLA Project Manager bridging the gap between the state and local level. Other than FBLA, Jack is an active member in high school community as a member of the River Hill Student Government Association Executive Board, anchor on the school new program, Hawk Talk, and Bass II in the River Hill Madrigals. Finally, he is the former President of River Hill’s Chapter of Best Buddies Maryland, but he now works as an intern in the Best Buddies Maryland Office connecting the state and local chapters through planning events and developing academic material. This year in Maryland FBLA, he strives to increase communication throughout the state through the website, chapter visits, chapter visits and personal leadership. Jack is excited to network with hundreds of Maryland FBLA members throughout the year and to help lead the state to the Gateway to Greatness! Jacob Darling, a senior at Colonel Richardson High School, is serving as your State Parliamentarian for the 2011-2012 year. This is Jacob’s third year as an active participant in the Colonel Richardson Chapter of FBLA, where he has been a competitive event participant for all three years, and served as Chapter Parliamentarian in 2011. Besides keeping the State Chapter in order, Jacob is active in his school and community. As a Black Belt in Shotokah Karate, Jacob can enforce more than just the rules in a meeting. A member the National Honor Society, elected member of Student Government, and leader of the Varsity Soccer team, Jacob has somehow also been able to manage his time so that he is ranked first in his Senior Class with a 4.2 GPA. When not at school or running a meeting, Jacob is active in his church and youth group, and can be found volunteering in his community. Colby Poffenberger has been in FBLA since he started high school in 2009 as a freshman. His freshman year he attended the National Fall Leadership Conference in Baltimore; this was where he fell in love with FBLA. At this conference there was a motivational speaker named Janine Driver She truly changed the way he viewed life and FBLA. After the NFLC he wanted to be more involved in FBLA, so he competed in Business Procedures at the regional competition where he placed 3rd. He went on the state conference and placed 3rd once again. That same year he attended the National Leadership Conference in Nashville, TN. At the end of his freshman year he ran for Local Chapter Treasurer, and won. His sophomore year he attended the Fall Leadership Conference, Regional Competition, and State Leadership Conference. He competed in Hospitality Management at Regional’s and got 2nd, then went on the states where he placed 4th. At the end of his sophomore year he ran for Local Chapter President, and won. After the state conference no one had filled the Region 1 Vice-President position, so he applied and got the position! He was overwhelmed with joy when he got the good news! This summer he will be attending the National Leadership Conference in Orlando, FL and will be working with the newly elected Maryland State Officer team! James Reed is a senior at Dundalk High School in Baltimore County, MD. This is James’s second year in FBLA, and he is very excited to be a part of Maryland FBLA. During his first year of FBLA he ran for local Chapter treasurer, and won. He went on to the Regional Competition and placed 3rd in Business laws. After making it to the state leadership Conference, he realized how great of an experience FBLA is, and wanted to play a bigger role in it. So when he heard that the spot for Region 2 VP was vacant he decided to run for the position. Once he heard back that he was appointed to Region 2 VP he was very excited to meet with the other state officers and entering the Gateway to Greatness with Maryland FBLA! Dillon Norris is a senior at Leonardtown High School in St. Mary’s County. Dillon has been actively involved in FBLA since his freshman year, attending the National Leadership Conference every year after placing 1st in Introduction to Business in ninth grade, 2nd in Business Math in tenth grade, and 3rd in Future Business Leader in eleventh grade (on the state level). As a junior, Dillon was treasurer for his local chapter and, with this experience, decided to run for Region 4 Vice President. FBLA has manifested itself as a great tool for Dillon, teaching him leadership and networking skills along with business knowledge that he plans to employ in a future in finance. Dillon’s school involvement doesn’t stop at FBLA, however. Dillon is an active member in his school’s National Honor Society, Student Government (on the school and county level), Peer Development Program, Interact Club, and Tutoring Program, holding leadership positions in the majority of these organizations. Although greatly involved, Dillon is currently ranked first in his class of 500, effectively balancing his scholastic and extracurricular responsibilities. Andrew began his journey in the Future Business Leaders of America in his sophomore year. Quickly realizing the opportunities in the program, he ran for the office of reporter in his local chapter. At his first regional conference he placed 1st in Word Processing I, then placed 3rd at the State Level. Andrew then proceeded to strive further by carrying out his duties as the reporter. By the regional conference of 2011 he competed in Spreadsheet Applications and placed 1st at the regional conference and 4th at the State Conference. Andrew also placed 2nd in the Partnership with a Business project on the State level. After being elected to the State office, Andrew also ran for local chapter president. He now serves as both Region V Vice President and Local Chapter President. After Breaking Barriers in the 2010-2011 school year, Andrew is looking forward to new opportunities to open the gateway to success in 2011-2012. Thomas Ozman has been a member of FBLA going on three years now. He is currently the President of his chapter in Region VI. Thomas has been to six conference's now including two Region VI Conference's, two State Leadership Conference's, and two National Leadership Conference's for Parlimentry Procedure. Although he did not win either National Conference he did take First Place at both State Leadership Conferences. In the Region Conferences he took First place his 2010 year and Second his 2011 year. Besides FBLA Thomas is in National Honor Society, National Techinical Honor Society, and works part time as a cook. Thomas is very excited for this upcoming year and cant wait to meet new people. Michael Wise is a senior at Northern High School in Owings, Maryland. He loves to play basketball and hang out with his friends during his spare time. AFter being involved for 2 years in FBLA at Northern, he decided to run for office in the position of Region VII Vice President of the State of Maryland. AFter seeing his close friend Katie Cano, and her success throughout the previous year, he knew he'd be prefect for the position! Not only would he be eligible for the position, but he'd also have an inside look from someone with close interest and much experience form the state officer team. With his excessive leadership skills, and stubborn determination/motivation, MIchael was able to be closely apart of the Community Service project that placed 1st at States and helped to raise over $25,000. Not only was this the most money made by Northern High School's FBLA, but he was also able to grow and connect with the project closely as NHS's FBLA partnered with the Corey Gilger Foundation in honor/memory of one of Michael's close friends. She was 14 when she passed away, and it was her last wish to help familes that were just like hers. With support from his family and friends, Michael has been able to work diligently to improve the overall success of his local chapter, after recently being elected to serve on the officer team as a chapter assistant at Northern. FBLA has truly changed his life, as he heads to Nationals from placing 1st in the state in Banking & Financial systems. Josh Dixon is a sophomore at Chesapeake Senior High School. He is enthusiastic and is privileged to serve as your 2011-2012 Maryland State Region 8 Vice- President. He joined FBLA his freshman year and immediately got involved. Josh started out as the chapter Reporter and the FBLA Week committee chair. He joined FBLA to improve his leadership skills and be more involved with the community and his peers. This year Josh is the chapter President and takes great pride in how far he has come in just 1 year! As far as Josh’s FBLA accomplishments, he ranked 1st place in Region 8 and 4th place in States for Business Presentation in 2010-2011. Along with FBLA Josh is a volunteer at the Riviera Beach Volunteer Fire Company. He said, one day he hopes to become a paramedic to help and get to know the community. He looks forward to organizing the 2nd Maryland Region 8 Conference this year and knows it will be a huge success! He now plans to open the Gateway to Greatness into the 2011-2012 year with Maryland FBLA!